The Surkhandarya province in southern Uzbekistan was once the heart of Bactria, a prosperous kingdom that flourished along the Amu River between 600 B.C.E. and 600 C.E. Teams of archaeologists from the Soviet Union began visiting the province in the 1950s to catalogue its archaeological riches—remnants of towns, irrigation networks, burial mounds, pottery, weapons, and many other items. 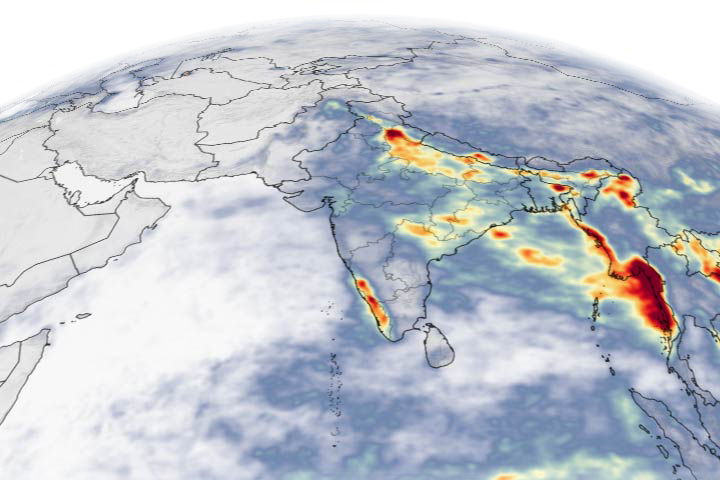 In the past decade, satellites have made a contribution from above as well. Since 2008, Ladislav Stančo of Charles University has led a team that used satellite imagery to systematically survey the area for archaeological sites. 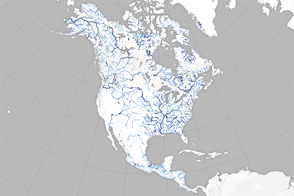 The researchers relied mainly on declassified spy satellite imagery from the Corona program, but they also gleaned insights from the Advanced Spaceborne Thermal Emission and Reflection Radiometer (ASTER) on NASA’s Terra satellite, from Landsat satellites, and several commercial satellites. Stančo and colleagues identified dozens of new sites and followed up with field expeditions to several new sites. 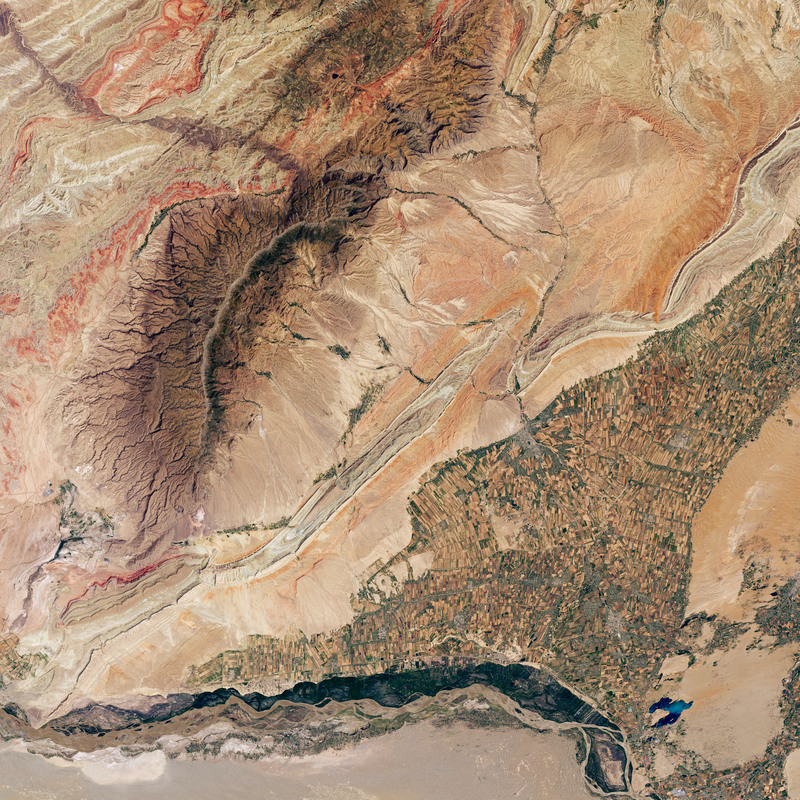 This image above centers on a colorful sequence of sedimentary ridges in southern Uzbekistan near several of the sites. 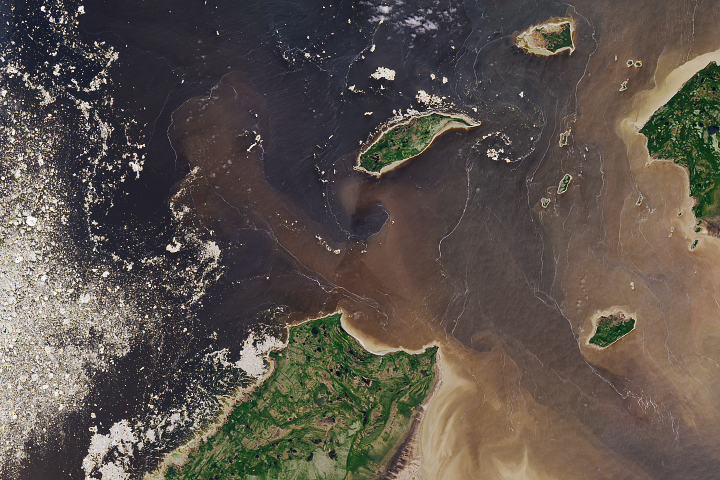 The image was acquired by the Operational Land Imager (OLI) on Landsat 8 on June 27, 2018. 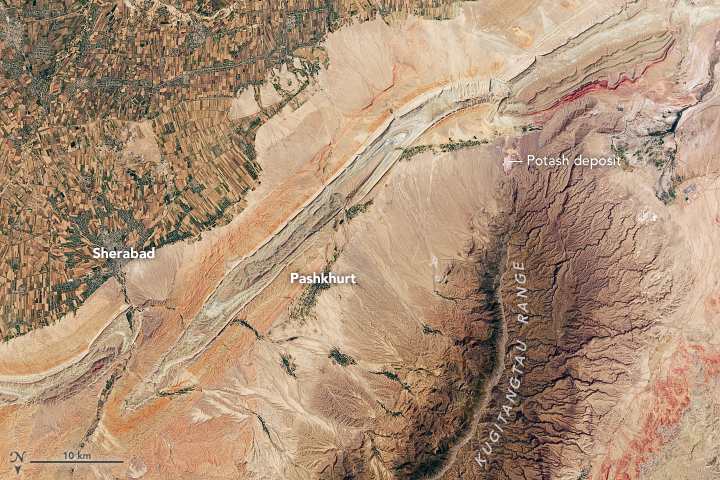 The ridges are sandwiched between croplands flanking the Sherabad River and the Kugitangtau Range. Note: the image has been flipped to minimize relief inversion. The ridges rise roughly 1,000 meters (3,300 feet) above sea level. 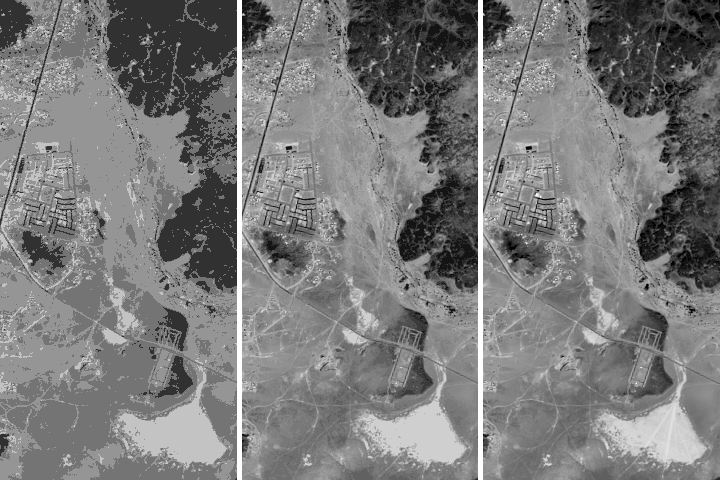 The second image shows the Landsat data draped over topographic data from NASA’s Shuttle Radar Topography Mission (SRTM). The Pashkhurt Basin—the area between the colorful ridges and the Kugitangtau Range—has a handful of villages situated around natural oases, including Pashkhurt, Zarabag, and Gos. The scientists discovered several archaeological sites around these villages, as well as several near Sherabad. Archaeologists think people living in Bactria were attracted to the area partly because of the presence of desirable minerals and metals in the foothills of the Kugitangtau Range. 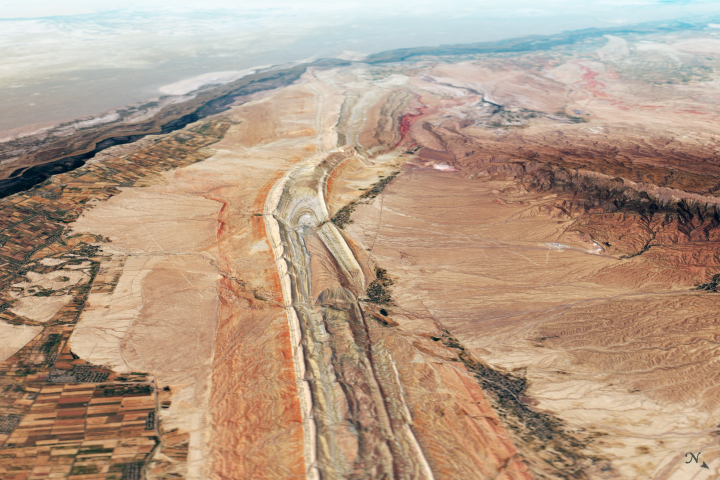 The small white areas are potash deposits, some of which continue to be mined today. People have long used potash to produce glass, soaps, and textiles. In current times, cotton is the primary crop grown along the Sherabad River, with much of the river’s water getting diverted for the thirsty plant. Intensive irrigation like this is common along rivers that flow toward the Aral Sea, and it has caused that large lake to shrink dramatically in recent decades. NASA Earth Observatory images by Joshua Stevens, using Landsat data from the U.S. Geological Survey and topographic data from the Shuttle Radar Topography Mission (SRTM). Story by Adam Voiland, with information from Franz T. Fürsich, Petra Tu&scirc;lová, and Ladislav Stančo. Archaeologists used satellite imagery to find new sites in the ancient region of Bactria. Academia (2018) Ladislav Stančo. Accessed August 6, 2018. Silk Road Foundation An Archaeological GIS of the Surkhan Darya Province. Accessed August 6, 2018. Stančo, L. (2009) The activities in Uzbekistan in the 2008 season: testing the Google Earth programme as a tool for archaeological prospecting. Accessed August 6, 2018. Tu&scirc;lov&aacute, P. Systematic_Field_Survey_in_South_Uzbekistan. Accessed August 6, 2018.